Question: Is there a way to be sure that our office secretaries receive copies of eservices I receive? Answer: Yes, there are a couple of ways to have additional staff receive copies of eService Notifications sent to firm attorneys. The first way is an official eFileTexas solution but it only allows you to designate one additional recipient. And, this process can only be completed by a firm eFiling Administrator. Here is a step-by-step description of the process. This second method is unique to FileTime and it enables you to designate an unlimited number of recipients for any eService Notifications sent to you, regardless of the service provider used by the serving counsel. This process is done by the attorney or someone logged in as the attorney. Click My Account on the top navigation bar (Figure 1, A). Click the drop-down arrow to the right of Notification Preferences on the sub-navigation bar (Figure 1, B). Click eService Notification Copies on the drop-down menu (Figure 1, C). You are now on the eService Notification Copies page (Figure 1). Any names and email addresses displayed in the eService Notifications Copies section will receive eService Notification eMails from FileTime when the attorney these names and email addresses are associated with is eServed. To add a recipient, click the + Add New Recipient button (Figure 1, D). 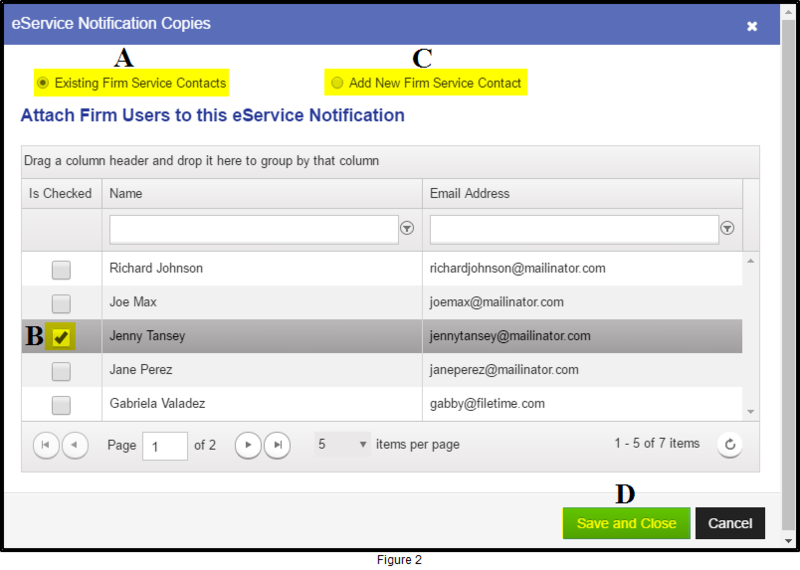 The eService Notification Copies page opens (Figure 2). By default, FileTime displays your firm's list of registered firm users (Figure 2, A). You may select one (Figure 2, B) or as many users as you require. If the individual you want to add is not found on this list, click the Add New Firm Service Contact option (Figure 2, C) and add that person to the list. When done, click the Save and Close button (Figure 2, D). You are returned to the eService Notification Copies page with the new recipient(s) added to the list. Click the Edit button (Figure 1, E) for a recipient to edit his/her name or email address. Click the Delete button (Figure 1, F) for a recipient to remove him/her as a recipient of eService notification emails for this attorney. 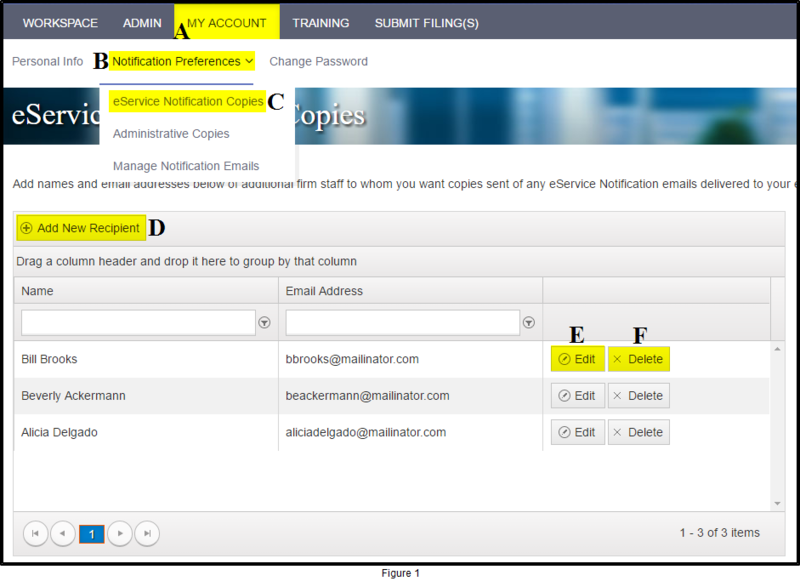 Firm eFiling administrators can also add additional eService Notification recipients for a service contact.